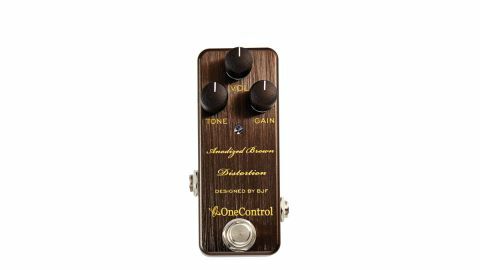 An extremely good distortion that does rock and metal brilliantly, but suits other styles just as well. Loads of useable tones. Controls are very responsive. Loads of sustain and harmonic edge. Not much - although the price seems steep compared to the bargain mini pedals we've been spoiled by of late. All of the One Control BJF mini-pedal series use a BJF buffer to enhance signal clarity on long signal chains. "It will go from crunchy raunch to stack at full pelt, all with loads of touch sensitivity"
The use of the English language in some of One Control's descriptions of the BJF pedals can raise a smile, but the gist of what is said about the Anodised Brown Distortion is that it's designed to provide cranked stack distortion while retaining amp 'feel', rather than feeling flat and undynamic like some pedals do. We'd say that's about right: it will go from crunchy raunch to stack at full pelt, all with loads of touch sensitivity and with bags of sustain with a harmonic edge under your fingertips on higher settings of the gain knob. It also features a tone knob that works over a completely useful range - no nasty extremes here, just differing degrees of top-end content.